1. How much does the loan cost? The most basic way to compare the cost of online payday loans is by looking at the interest rate on the loan over a year. This is the APR or Annual Percentage Rate. By law, payday lenders must show you the interest rate as an APR. You should be very careful when a loan gives you rate that isn’t APR. We’ve seen payday lenders provide rates as "$ fees per $100 borrowed," which often makes a loan feel cheaper than it really is. We looked at the APRs from 4 of the most commonly used online payday lenders throughout Texas. As you can see, the APR can be wildly different even if the difference in $ Fee is just a few dollars more. Unfortunately, there’s more that online payday lenders will do to hide the rate. We’ve seen lenders hide their APRs far down on pages of their website or advertise a lower rate only to add application and maintenance fees, which increase the total cost of your loan. 1. Please check respective lenders' websites for latest up to date rates. These rates are for illustrative purposes only. Even though it may be hidden on their website, payday lenders are required by law to disclose the APR on their loans. Fortunately, it's always in the same place: the Consumer Disclosure. In the example above we look for a link called “Rates and Terms” or “Notices and Rate Disclosures.” In the state of Texas, this page must be there by law. If the page doesn’t exist, avoid this lender! Once on the "Rates and Terms" page, make sure you’re looking at the right product. In our example we’re looking for an online installment loan in Texas. Within Online Installment Loans, find the loan amount and loan length that you are looking for. In our example, we’re looking for an installment loan in Texas for $300 that has 4 monthly payments. 2. How long is the loan for? The length of a loan is how long you will be paying the loan back. Together, the length and interest rate determine how much you'll ultimately pay back. The length of the loan is also referred to as the term or term length. 1. We call it Total Cost of Loan Without Fees because it does not include additional fees. Fees are unfortunately a large part of the Total Cost of a Loan and often not included in the APR of the loan. 2. This calculation should only be used for illustrative purposes regarding the impact of interest rates over time. It does not include concepts such as compounding and multiple payment periods. Please reach out to your lender directly for a more detailed calculation. Using the formula above, we calculated the Total Cost of a Loan Without Fees for a $100 loan over a 2 week, 1 month, 4 month and 6 month loan term. The first thing you see is that a shorter loan will cost less in total. While this is true, it may not be the best payday loan because you must be able to make the payments! If you are unable to make a payment, the length of your loan increases and you will be charged extra fees. Increasing the length of your unsecured loan increases the total amount you will pay back. It’s best to choose a payday lender that shows you exactly the how much each payment will cost and how many payments you need to make so there are no surprises. This leads us to the very important topic of payments. Knowing the payment schedule, how often you pay, and the amount you pay are crucial to successfully paying off your loan sucessfully. Let’s explore this topic below! Example: Loan Term Comparison Chart for a $100 Loan. 1. This example uses hypothetical data and is only for illustrative purposes. When you increase the length of your unsecured loan it increases the total amount you will pay in total. It’s best to choose a payday lender that shows you exactly the number and amount of each payment so there are no surprises. This leads us to the very important topic of payments. Knowing the payment schedule, how often you pay and the amount you pay are crucial to successfully paying off your loan sucessfully. Let’s explore this topic below! 3. Can I make the payments? This is the #1 question you need ask when looking at a loan’s payment schedule. The information below will help you understand the two types of payments and how each affects the size of your payments. BUT only you know how much you can comfortably pay each week, 2-weeks or month. There are two types of payday loans: balloon and installment. The two loan types have different payments, each named after the loan type. A balloon loan is paid off with one large payment at the end of the length of the loan, (aka balloon payment). For this type of loan, you pay back all of the borrowed money and cost of the loan at once. Most payday loans are balloon loans and you need a lot of extra money to pay them back on time! An installment loan that is repaid by in portions over time (aka installment payments). These loans are often repaid in equal monthly payments that include interest and a part of the originally borrowed amount. Since you will be making multiple payments for an installment loan, it is important to consider if your budget allows you to make these regular payments for the entire length of your loan! Now let's look at the payments for some sample online payday loans. 1. This example uses hypothetical information and is only for illustrative purposes. Looking at Payday Lender A, the balloon payment for this loan ($126.15) is due in 14 days! If we’re borrowing $100 today, are we sure we will have enough money in two weeks to pay back the entire $126.91 due? Keep in mind that this is just for $100… most payday lenders only allow loans of $200 or more. Will you have an extra $252.30 to pay off a $200 loan 14 days later? Looking at Lender D, paying 4 payments of $67.95 for a $100 loan seems like a lot. We could probably pay this off sooner. Paying early would lower the length of the loan and save money! Lastly, if we compare Lenders C and D, we see that the payday loan offered by Lender C is better because it allows you to make smaller, more frequent payments. These earlier payments reduce the amount borrowed sooner which saves you money in interest! We recommend taking out installment loans rather than balloon loans. Installment loans are easier to manage because they have a regular schedule with more reasonable payment sizes. Being able to reschedule payments and pay the loan off early are the most important part of payments! But some lenders charge expensive fees for these services. Next we look at an online payday loan’s fine print to see when extra fees are charged. 4. Are there extra fees? Is there a late fee for rescheduling payments? How much is it? Is there a fee if my payment is returned? How much is it? Does it cost more to repay my loan early? These are questions you should ask your payday lender before accepting a loan. It’s important to get clear answers and double check the fees in your loan documents before signing! Be extra careful with fees because they are NOT counted in the APR of the loan but very significantly affect the total cost of your loan. What if you need to reschedule? Even if your payment is 1 day late, payday lenders often charge a late fee up to $30! The best place to find the late or change fees is in your loan documents, although sometimes they are shown in the Consumer Disclosure. 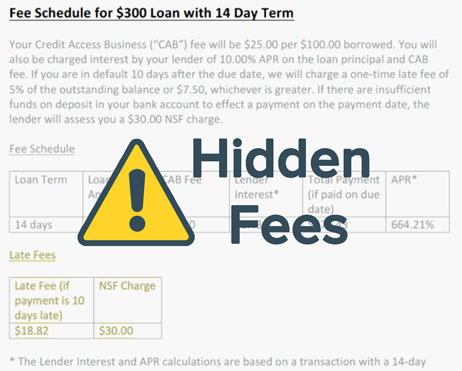 We’ve included an example of a Consumer Disclosure with late fees highlighted. If there is no mention of late fees anywhere, call the payday lender to make sure before you take out a loan! Only payments for installment loans can be changed! Customers are often promised “rescheduling” for payday (balloon) payments but actually end up paying to reborrow or “rollover” the loan instead. This may seem like extending your payment, but is actually a trick to trap you in debt. The payday lender will often ask you to pay all your interest + fees on the original due date and then continue to charge you interest + fees so you’ve basically taken out a new loan! When you contact Fig to change a payment, you will never be charged a late or change fee! Since only installment loans can be rescheduled, let’s look at the impact of late and rescheduling fees on a Lender D $100 loan for 4 months at 680% APR in our previous example. Using a sample online payday lender’s rates, if your payment is more than 10 days late your late fees will be $20. So if we paid a loan payment 10 days late to Payday Lender D, we would be charged an additional $20. If your original Total Cost of Loan without Fees was $271, a single late fee can increase your Total Cost of Loan by over $20! If you reschedule two payments or the same payment twice, you are looking at an extra $40 that you didn’t realize you needed to pay! If you are at all worried about making every payment in full and on time, you will want to look closely at a lender’s late or rescheduling fees and factor them into your Total Cost of Loan With Fees. 1. This example uses hypothetical information and is for illustrative purposes only. NSF fees occur when one of your payments is returned by your bank to the lender. The bank often charges you an overdraft fee, but some payday lenders will charge an additional fee on top of that. This is very similar to a returned check fee you might see at grocery stores. A single returned payment can cause you to owe an extra $65. How? If your payment bounces, a bank overdraft fee is $35 and the lender’s NSF fee is another $30! Let's look at Loan D with NSF Fees. If your payment is returned your bank would charge you $35 and then Payday Lender D would charge you an additional $30 in fees. This would take your original payment of $67.95 up to $132.95. That’s almost double your original payment amount! Our problem with NSF fees is that they are ENTIRELY AVOIDABLE when a lender and borrower work together. At Fig we work with you avoid NSF fees, and it works we have no change fees! Payday lenders often charge extra when a borrower wants to pay off their loan before the due date. This is called an Early Repayment Fee. They do this because they make less money when a loan is paid back early! Payday lenders should not make it harder (and more expensive) for good borrowers who are trying to settle thier debt. It shouldn’t be up to them! When you see an early repayment fee, you should question if the lender is truly interested in helping you improve your financial future. You will never find an early repayment fee at Fig. You can pay off your loan early and we'll even give you a discount! 5. Does it report credit? A large benefit to taking out loans is credit reporting. Credit reporting builds up your credit score, telling other lenders you are a good borrower so they can offer you better, cheaper loans! Lenders should report credit because it is a major benefit for borrowers that is easy for the lender to provide. If a payday lender is not reporting credit or claims it’s too expensive, you should be very concerned that lender is hiding something. Our recommendation? Find a different lender who will help you build your credit score, not hurt it. All Fig Loans report credit to TransUnion, Equifax and Experian, helping Americans build healthy credit since 2015! We hope you enjoyed our 5 step guide to comparing personal loans and feel ready to pick out the best personal loan for you.